Cream together shortening and sugar. Add vanilla and eggs and beat well. Add molasses. Add flour, cocoa, soda and salt. Mix very well. Form into small balls, roll in extra sugar, and place on baking tray. Bake for 8-10 minutes at 350 degrees F. Watch them for the crinkly tops, and don’t over bake. I love your brownie recipe. They truely are the best ever made. I also make your Chinese Chews. I make a batch every week. They are delicious. Made these with the kids today. fyi — they make awesome ice cream sandwiches! 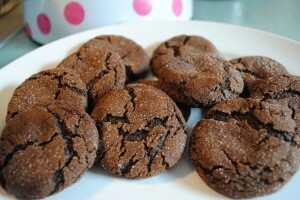 I baked the chocolate crinkle cookies gluten free. I used 2 cups of Bulk Barn’s gluten free flour in place of the regular flour. They turned out great! These cookies are the BEST…I can’t keep them in the house!!! Oh my goodness these cookies were SO good and so easy (and fun!) to make! I had 2 little girls helping me (4 & 5) and they had a blast rolling the cookies and rolling them in the sugar. They tasted SO good that I have no doubt that by tomorrow night they will be long gone! I think we think the same way. I heard somewhere that you could replace some of the flour in a recipe with cocoa powder to make it chocolate flavored and I’be been meaning to do that with molasses crinkles for some time. I’m going to try your recipe today!